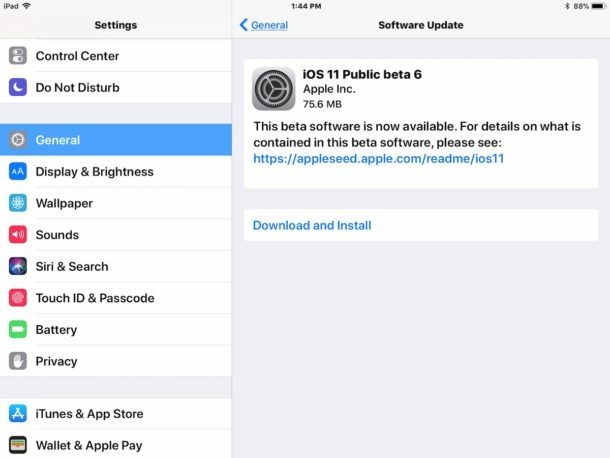 Apple has released the sixth public beta versions of iOS 11 and macOS High Sierra to users enrolled in the public beta testing programs, along with iOS 11 beta 7 and macOS High Sierra 10.13 beta 7 for developers. The public beta and developer beta builds are the same despite having different version numbers. No major new changes seem to be included, as the beta builds likely focus on refining the operating systems for the near future public release. Users who are enrolled in the respective beta testing programs can find the latest updates available now. In iOS, that’s through the Settings app Software Update function. In MacOS, the macOS High Sierra 10.13 beta 7 update is available via the App Store Updates tab. While anyone can install iOS 11 public beta, the beta is a particularly worthwhile consideration for iPad users given the significant new features and changes brought specifically to the iPad with iOS 11. Additionally, developer beta 7 of tvOS 11 and watchOS 4 are also available for users interested in beta testing system software on their Apple TV and Apple Watch. iOS 11, macOS High Sierra 10.13, tvOS 11, and watchOS 4 are all due to be finalized and released this fall to the general public. For whatever reason handoff started working for the first time since it was introduced with this update.